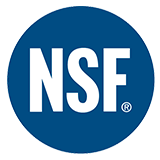 NSF International helps protect consumers by certifying products and writing standards for food, water, air and consumer goods. As an independent, not-for-profit organization, their ongoing public health commitment is to encourage everyone to live safer. For more than 60 years consumers have seen the NSF mark on millions of consumer products. Cambria is proud to be certified by this leading consumer goods organization as safe for use as a food preparation surface. Cambria is nonporous and nonabsorbent, which means it doesn’t allow liquids to penetrate the surface, thereby reducing the risk for stains and bacterial growth. Additionally, Cambria requires no sealing, polishing or reconditioning…ever. Simply wipe with warm water – it’s that easy.